We have specialised in logistics solutions for container transport along the Rhine and established reliable scheduled services to and from Antwerp and Rotterdam for this purpose. A fleet of 16 liner vessels is deployed for you on the waterway on three different lines. This allows us to reach all the important economic areas on the Lower, Middle and upper Rhine. Our own fast block train connections complete our hinterland traffic portfolio. Our CSA Andernach and ETK Kehl handling terminals form important logistical hubs of our infrastructure with interfaces to local truck provision. Trimodal transport is our speciality. Haeger & Schmidt Logistics is your one-stop shop for a whole range of container transport services. Our scheduled services by ship allow for safe planning of our customers’ container shipments along the whole length of the Rhine. Regular departures over 20x a week ensure continuity in the flow of goods. 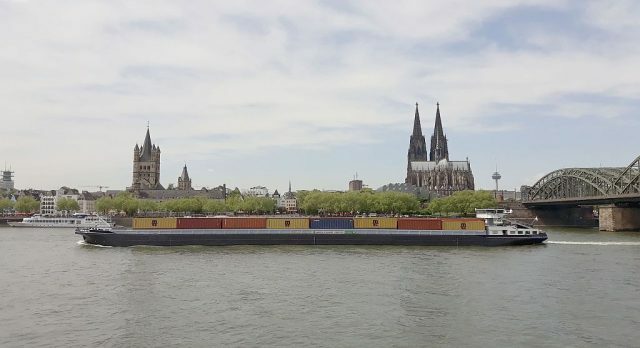 In order to guarantee a fast and regular connection of seaports, especially on the Upper Rhine, we run regular scheduled train services 14x a week between Antwerp, Rotterdam and the Rhine.